So far, we have been looking at low pressure systems; cyclones. But what about high pressure systems; anticyclones? From a weather perspective anticyclones can be quite boring. Where the air pressure is high at the surface in an anticyclone, the air above it descends. As the air descends, the pressure rises (because there is more atmosphere above) and so the temperature of the descending air rises. In this case, evaporation usually exceeds condensation and so cloud droplets don’t form. The air is mostly clear with only small amounts of cloud cover. 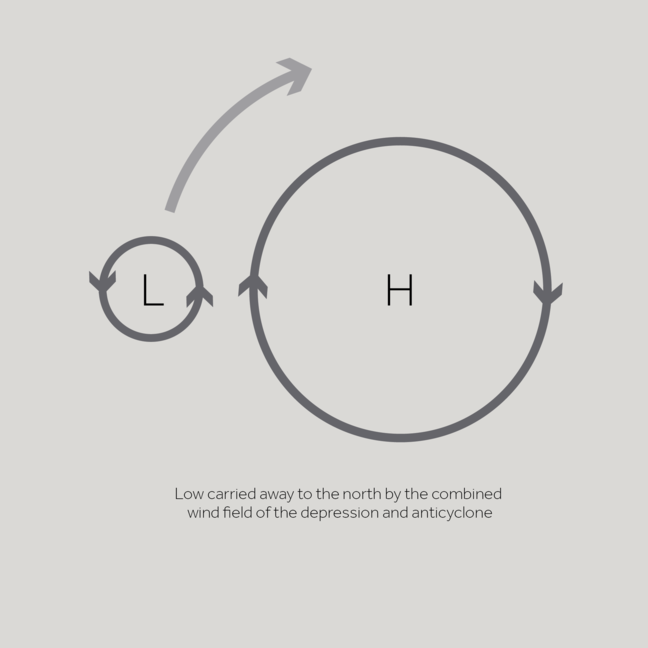 In the Northern Hemisphere winds blow in a clockwise direction around an anticyclone. As isobars are normally widely spaced around an anticyclone, winds are often quite light. 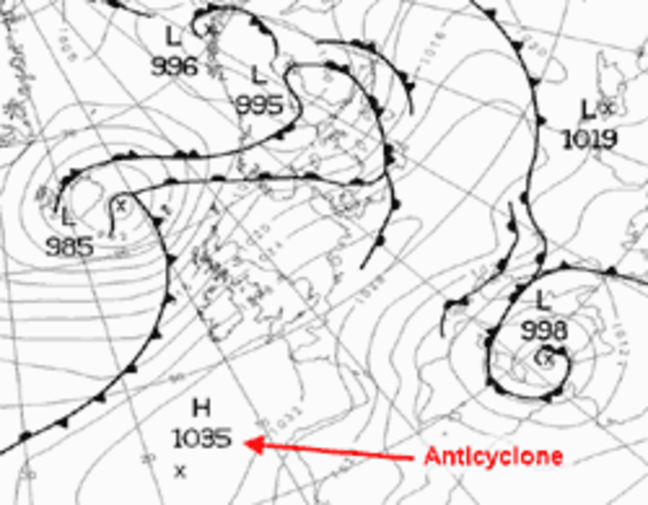 Figure 1: The weather map corresponding to Figure 2, showing the location of the anticyclone © Crown Copyright, Met Office. Anticyclones can be identified on weather charts as an often large area of widely spaced isobars, where pressure is higher than surrounding areas (Figure 1). It’s worth noting that there isn’t a critical pressure value that determines when we have high pressure, it simply depends on what is going on around. If the pressure is higher in one place than the places around it, then it is a high pressure area. 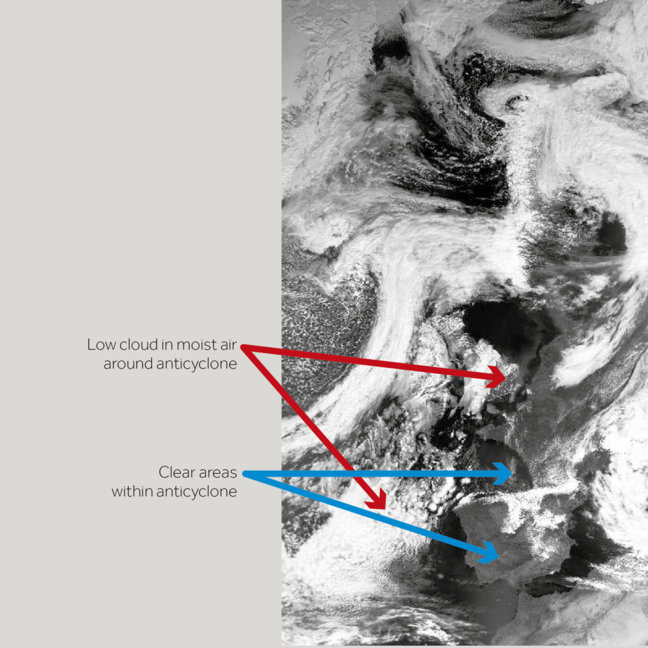 On a satellite image (Figure 2), an anticyclone shows up as a clear area. Anticyclones can bring us very cold, crisp bright winter days and warm, sunny summer weather. In winter, the clear, settled conditions and light winds associated with anticyclones can lead to frost and fog. 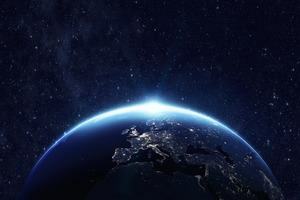 The clear skies allow heat to be lost from the surface of the Earth to space by radiation, especially overnight, allowing ground temperatures to fall steadily, leading to air or ground frosts. Sometimes in late winter or spring, the air near the ground cools so much that low cloud, or fog, can form. Because of the light winds associated with anticyclones; this can linger well into the following morning and be slow to clear. It is known as ‘anticyclonic gloom’. March 2016 was a typical example of this. When the air near the ground is cooled like this, it can lead to there being colder air near the ground and warmer air above. This reversal of the usual fall of temperature with height above the ground is called a ‘temperature inversion’ and it acts as a sort of atmospheric lid, trapping pollution, cloud, and mist in the cool layer of air near the ground. This explains the particularly depressing nature of anticyclonic gloom: the overcast sky is accompanied by haze and mist, rising pollution levels, poor or indifferent visibility, and a moist, heavy atmosphere. There may even be a damping of drizzle in the air, but heavy rain is very unlikely. Such weather may last several days, until the high pressure system collapses, or until a weak front introduces cleaner air from outside the anticyclone’s circulation. In summer, the clear settled conditions associated with anticyclones allow the Sun’s light to warm the ground. This can bring long sunny days and warm temperatures. The weather is normally dry, although occasionally, very hot temperatures can trigger localised thunderstorms. An anticyclone situated over the UK or near continent usually brings warm, fine weather. 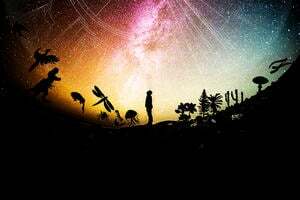 In summer over land, days are warm or hot and sunny, nights are clear. When anticyclones are over the sea, the weather can vary from fine and sunny to overcast cloud. This cloud may be thick enough to give drizzle and may form low enough to produce fog. This happens most often during spring and is least frequent in autumn. If the anticyclone extends over both land and sea, cloud and fog can spread across coastal regions, sometimes reaching quite far inland. 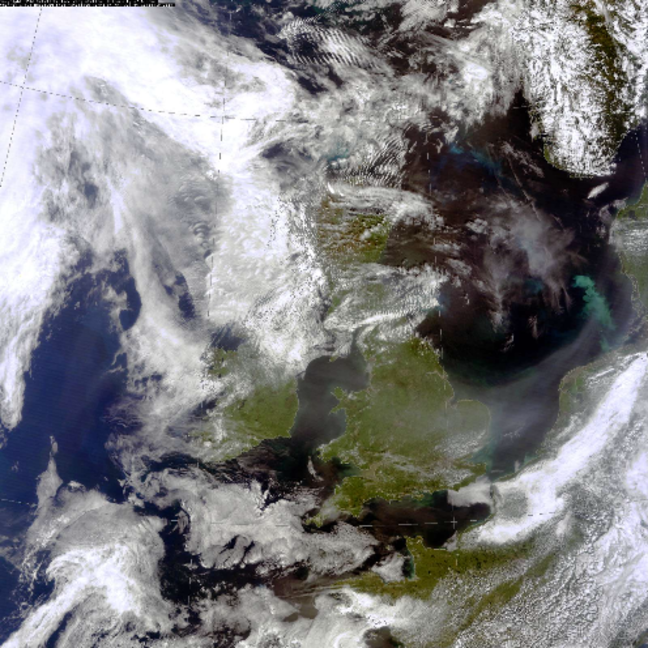 Sometimes, an anticyclone doesn’t move and remains stationary over the UK or nearby for a longer period of time. These ‘Blocking Highs’ divert the much smaller depressions away and lead to a longer period of clear weather, as can be seen in Figure 3. 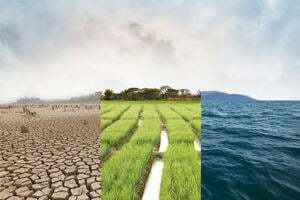 During the summer, these blocking anticyclones can lead to drought conditions, as rain-bearing fronts are ‘diverted’ around the country. This is what happened in 1976 when an anticyclone sat over the UK for much of the summer, causing a noticeable drop in rainfall, well below the normal average, and leading to water shortages. 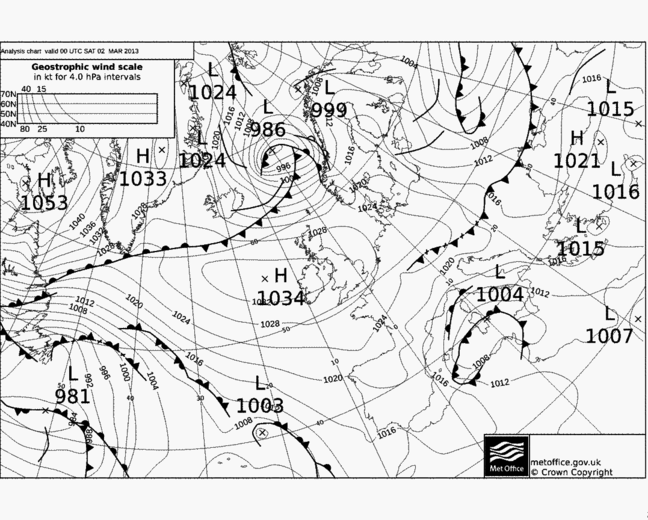 Figure 4: A typical synoptic chart or weather map from July 2013 © Crown Copyright, Met Office. The summer of 2013 was dominated by anticyclones (Figure 4), leading to prolonged nice weather in England and Wales. In the satellite image in Figure 5 you can see a line of cloud to the North of Ireland. This marks the warm front associated with the Low near Iceland which you can see in the weather chart. This Low will travel to the north of the UK, bringing rain to Norway. Spring 2013 was also characterised by high pressure – the weather chart (Figure 6) shows a typical situation with high pressure over all of the UK. The high pressure blocked milder, Atlantic air from reaching the UK as well as bringing bitterly cold, north-easterly/ easterly wind. Remember that winds blow around anticyclones in a clockwise direction along the isobars, and see what that means the wind direction is. 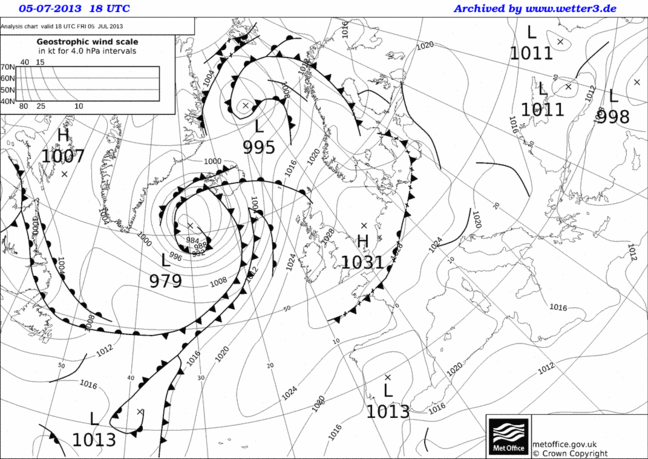 Figure 6: A typical synoptic chart or weather map from March 2013 © Crown Copyright, Met Office. Occasionally, the High moved to allow depressions to move up the west coast of the UK – where the rain on the fronts met the very cold air to the east, it resulted in heavy snowfall. The generally clear night-time skies at a time of year when the Sun wasn’t warm enough during the day to warm the ground much, led to the second coldest March since 1910. 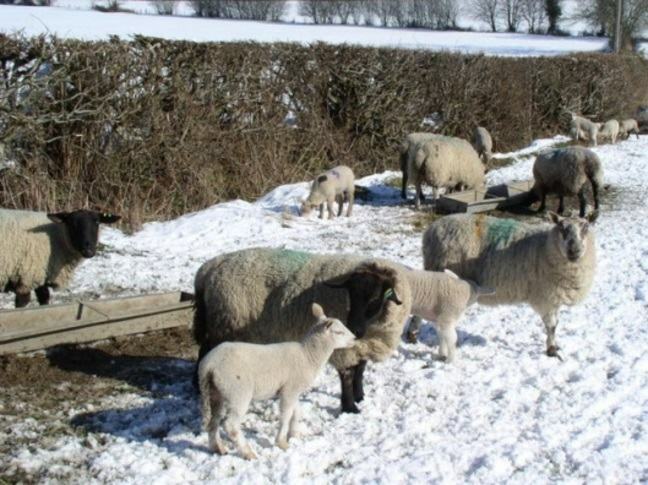 The winter snow persisted far longer than usual, leading to problems for hill farmers with sheep lambing into the snow (Figure 7). In parts of Wales laws were relaxed concerning the burial of dead livestock.